It is easy to take a nice direct bus from San José, Costa Rica all the way to Panama City but there is much to enjoy before Panama City as it is far south. I opted to go only as far as David, Panama’s second largest city, and see some of the north en route down. This is the view from my lounge chair as I say and wrote one day. 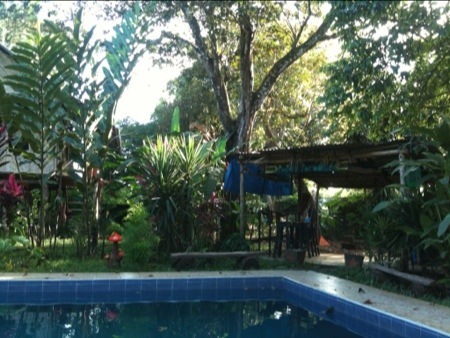 This is the back yard of Bambu Hostel – low-cost accomodation in David, Panama. 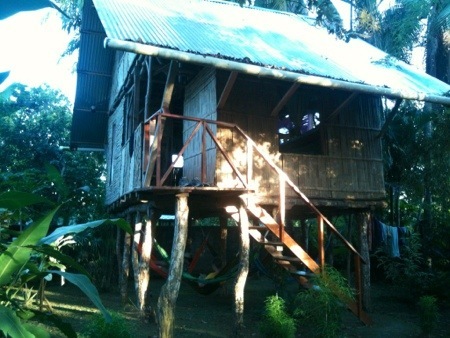 Bambu is a hostel — casual and budget accomodations. There are some private rooms with and without private baths for $25/$30. There is an indoor 6-bed (3-bunk) dormitory with a bathroom (not shower) for $11. To the right in my photo above, you see the bar. It is a nice place to hang out in the evening. As you see, it is poolside. If you are seeking luxury, this is not the right choice for your stay in David. 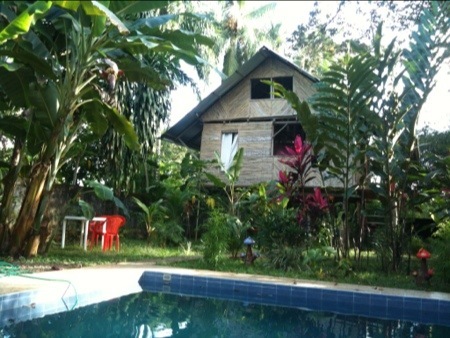 If you are a backpacker or a casual traveler looking for basic lodging with hot showers, a relaxing vibe, a pool, and a kitchen you need not use due to fantastic cheap food close by – then this is a good choice.